I'm working away at a new design, the one which will include a bit of fabric and hand-sewing. Part of the pattern is based on some small toys I made for my friends as gifts. The knitting part of that is going well, since I had already made several. I just needed to work out a few different variations, to make the pattern more interesting. The other part of the pattern is a new idea, related to the first part by being done in the same yarns and variations (this will make way more sense when I have some photos to share). It's proving to be more of a challenge! Often, when I'm working on a design that is similar to toys I've made before, everything comes together quickly and easily. 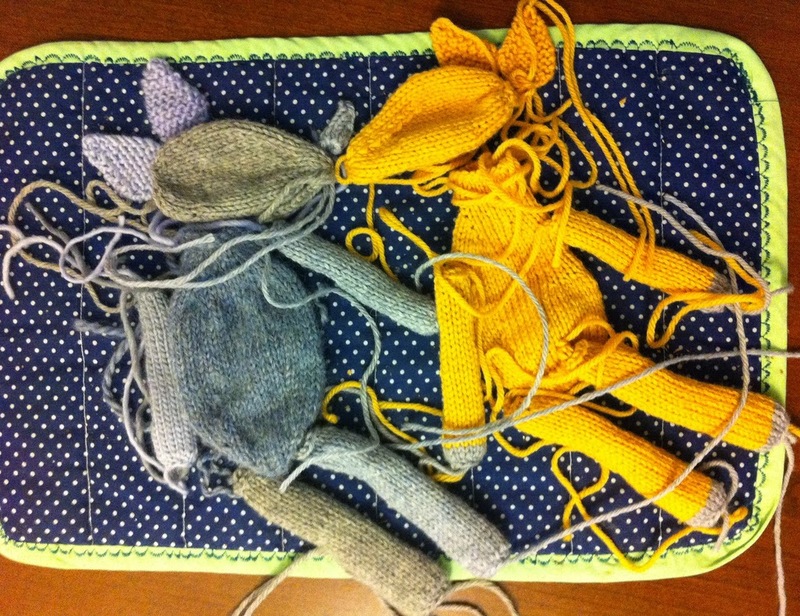 At worst, I might have to try a few variations of the head and ears, to make sure the shaping (and/or intarsia) are just right. But when it's something really new, it doesn't always come out right the first time, or even the fifth! I try out different sizes, change the dimensions slightly, move around the increases and decreases. I'll may try out short-row shaping, or binding-off and casting-on new stitches. Occasionally, I'll try a different construction, as it may work better in 2 or more pieces. Sometimes, all these attempts to get the design just right end up making it too complicated, and I worry that knitters will decide not to bother with it. So I stick to some simpler, but less perfect version, telling myself, "It's good enough." And I move on, knowing that most knitters will be happy with the outcome, even if I will keep picking at it on my own. An example of a design in progress. The one on the right ended up being cut from the final pattern. When I design something that I'm not 100% happy with, it always leaves me feeling like I want to learn more. Maybe if I knew a different stitch or technique, or had a better knowledge of how to shape a knitted fabric, I could design something just how I imagine it. Sadly, I can't often find the time to learn new skills, with so many important tasks filling up my days. When I can, I pick my personal knitting projects specifically to learn something new. But I don't always know exactly what it is I don't know! Do you enjoy learning new skills and techniques, or do you prefer to stick to what you know and are good at? How do you prefer to learn new skills? Oh, I love learning new skills in knitting... One or two at a time. Usually it's something I come across in a pattern and I learn either by the pattern or I google untill I find a usefull tutorial. Though a video would seem the most usefull tut, I can hardly bear to watch knitting videos... Those fingers, always pulling and stroking the yarn- again and again... It makes my hairs stand on end... Totally distracts me from the knitting technique.. I do tend to try to knit everything in the round, because I don't like the proces of and the result of seaming- I can't get it up to my standard, at least not completely. I am curious about the pattern! January 21, 2014 at 6:34 p.m.
What's the saying, "It's the journey..."
I'll be 66 this year. If I ever have a day when I don't want a challenge, be it just a game of Sudoku or learning a new skill, life will cease to be a journey. I'm glad you're pushing yourself to do something you find difficult. It's how we keep growing and what makes life interesting and entertaining. We're always our own worst critics. So question what you're thinking. Get opinions from others (whose opinions you trust). And even if something falls just a little shy of what you set out to do, the journey you have taken has been invaluable non the less. So don't think of it as wasted time. You will learn from it and use it to go on to create something fantastic. January 21, 2014 at 11:05 p.m.
which was talking about creativity being HOW we think. Your blog today gave me a glimpse into your creative process, and I LOVE doing that. It's one reason Project Runway is one of my favorite shows, and the designer segments of Knit and Crochet Now are so interesting to me. I learn best by seeing, either in a picture, video or in person. Topic for discussion: Can creativity be learned? January 22, 2014 at 10:01 a.m. I LOVE learning new crafty skills!! I try to pick patterns that I'll learn something new in or they just look very interesting. Learning new skills just gets me more passionate about my passion :-) and it gets the creative juices flowing. Thank you for the glimpse into your design process! I love reading about that! I am so excited for your new pattern!!! I can't wait! January 23, 2014 at 12:50 a.m.